​A Rube Goldberg machine is a contraption, invention, device, or apparatus that is deliberately over-engineered to perform a simple task in a complicated fashion, generally including a chain reaction. 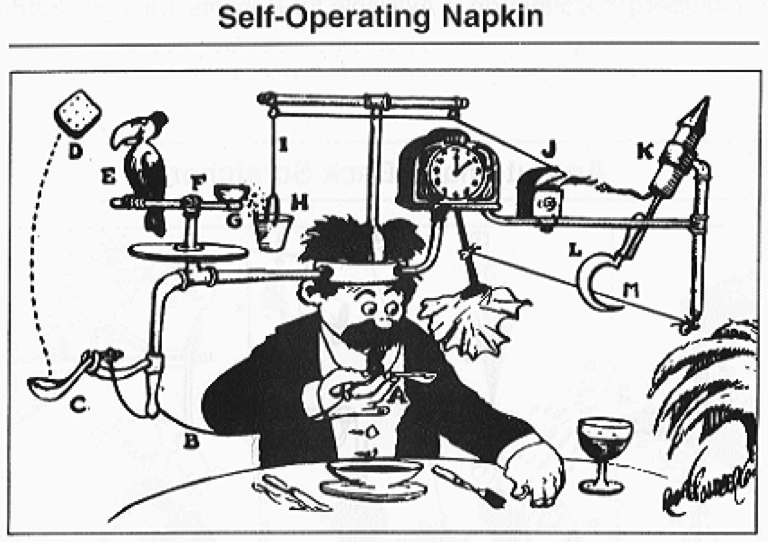 The expression is named after American cartoonist and inventor Rube Goldberg (1883–1970). 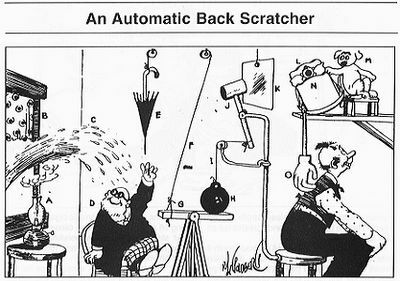 Rube Goldberg's cartoons became well known for depicting complicated devices that performed simple tasks in indirect convoluted ways. ​Your mission is to find a real world problem/task (or a simple task that you would prefer a machine do for you) and design a machine or tool to do it for you. The final task should be something that is usually very simple to do but you must over engineer the steps it takes to complete it. 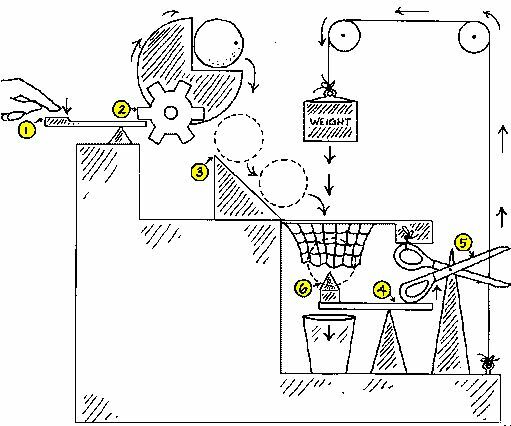 Begin by designing your own simple machine on paper/Sketchup/CAD that utilizes at least 5 different steps before your machine completes it's task. Play 15 minutes of "The Incredible Machine" and see how far you can get or design your own machine in the software! -discuss the best parts of each of your designs and choose the parts you want to include in your final machine. Before any building/construction begins you must have your design sketches, research, etc complete. This should be about 2-3 days of just design and planning. What must you hand in? It should be easy to reset so you can use it over again and again. In addition to building your project you should be documenting your progress along the way for a final group presentation. This should include both photo and videos. When completely finished you should have a final set of blueprints and any paperwork you used along the way! Do not throw anything out!  The machine must complete the task as described in the challenge. If not, points kept for the same would be deducted.  The machine must be no larger than 2ft x 2ft. The support from only one wall is allowed (you can use windows if present on that wall) and the top ceiling is not allowed of any form.  The machine must have a minimum of 10 steps if the machine has less than 10 steps the respective pool would be disqualified from the competition.  Only one member from the team is supposed to explain their machine before the demonstration.  The machine will have a 10 minute reset time if they go for more than one run.  Only one team member may interact with the machine once the evaluation has begun. This includes resetting the machine during the run. This means that only one person will be inside the arena. However if the team goes for another run the restriction of one person inside the arena is uplifted until the machine is ready for the other run. 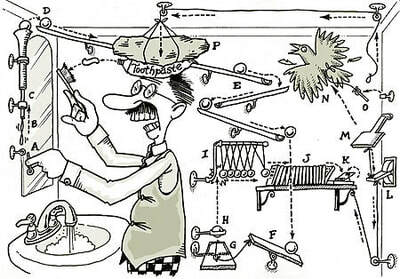  Any loose or flying objects must remain within the set boundaries of the machine. This includes, but is not limited to, drops of water, slivers of balloon, and other “small”objects. Steam and other gases are exempt from this rule. However for the sole purpose of electrical connection wires can be outside the boundaries of the machine.  Each team is supposed to submit a copy of a step-by-step description of their machine. 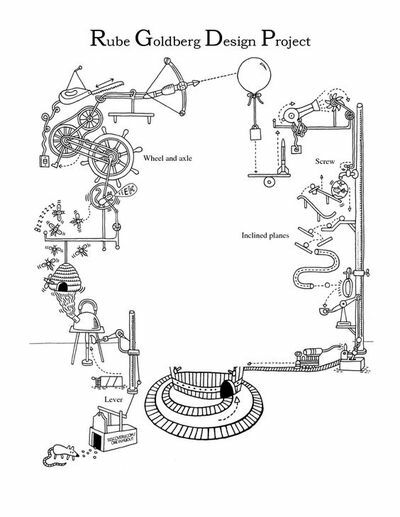 Diagrams and pictures have to be included in this description along with the typed information. If any team fails to submit the copy of the abstract then they will automatically be disqualified from the event. Team is encouraged to submit a video of the running of machine along with the written copy of description. Bonus 5 points would be awarded for the same. another action. Identical transfers of energy in secession should be considered one step. technically each single domino falling is a step, stating one hundred steps because of the dominos is repetitive and not in the spirit of Rube Goldberg.  The task should be completed in not more than 4 min time.  No hazardous materials or explosives may be used on or within the machine.  No live animals are allowed in the machine.  Every team will be given maximum two runs for the completion of the task and if in case a team is not able to complete the task in their first run and they can go for second run.  For every human intervention the points will be deducted.  Any destructive action against another machine is grounds for disqualification.  Programmable Logic Controllers or any other electronic controller/devices may be used on the machines. The use of these devices must be in line with a step. Using these devices as a fail-safe for the machine is illegal and grounds for disqualification. acting as failsafe so the machine can finish and not in line with definition of a step. the device is merely transferring the energy from one step to another, so this is line with the definition of a step. clearly stated in the step-by-step description submitted along with the written description. information of how the step is being accomplished.